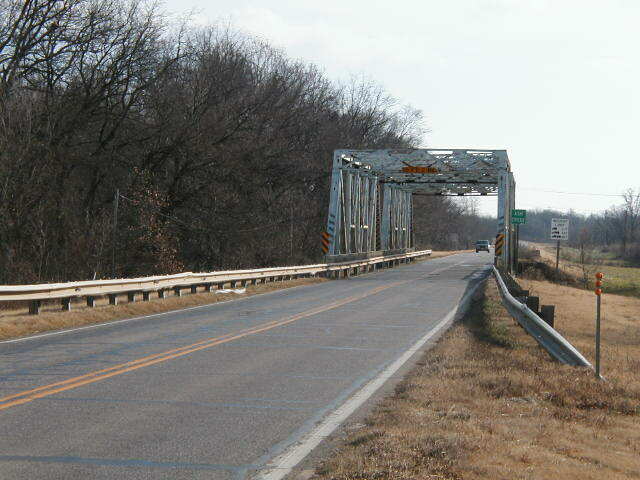 US 64 Across Ash Creek, Muskogee County. 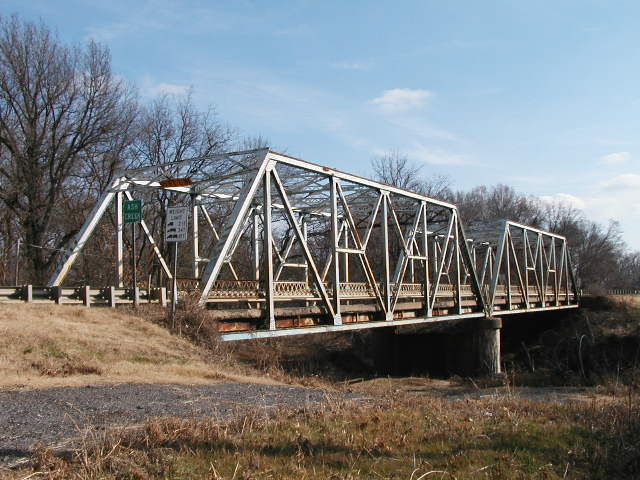 This pair of 100-foot through modified Pratt spans was built in 1929, and has been altered very little since construction, other than the removal of curved knee-braces in the portals, as has been done on other bridges of this vintage elsewhere. Above, a view looking East through the bridge. The 100-foot modified Pratt was a state-standard design and has given reliable and predictable service throughout the state. 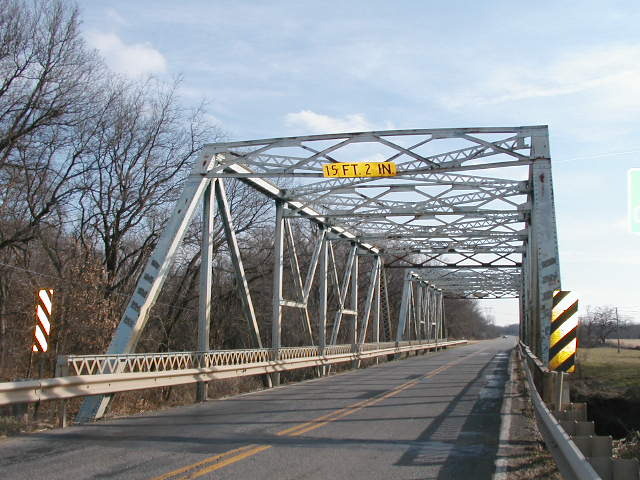 The trusses on these spans are still in excellent condition, and carry a weight limit of 21 tons for simple vehicles. Below, a side view of the bridge. The lattice guards are typical of this era. below, a close-view through the bridge showing the portal frame, guards, and truss design. Earlier examples of this design used much more lacing in the web members. This example uses tie plates and solid plate sections. Earlier, I mentioned that the trusses were in very good shape. 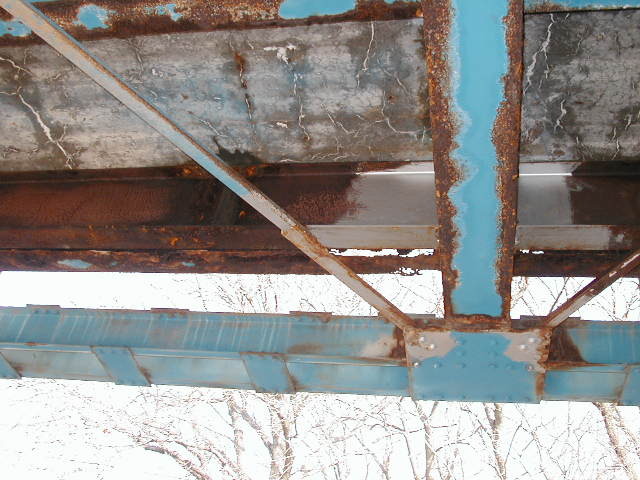 Unfortunately, much of the deck structure, particularly the stringers on the north side, have rusted away. The photo below shows a stringer and its modern "double" that carries the load now. Note that the original stringer has been completely eaten through near the panel joint. The sad truth is that this damage could have been prevented through monitoring and routine maintenance. However, through neglect and a severe mismanagement of resources, this member has rotted away to the point of needing replaced. You can see that these same forces are now acting upon the new stringer. More photos of the damage in the Ash Creek Bridge.